Roughly two hundred years after the Northern Ten Tribes of Israel were taken captive by the Assyrian empire, the two remaining tribes of Judah and Benjamin fell to the Babylonians. You can read of this captivity in the Book of Daniel. About twenty years into the captivity, Daniel had been made ruler over the whole province of Babylon and chief of the governors over all the wise men and in turn, Daniel has requested of Nebuchadnezzar to appoint Shadrach, Meshach and Abednego over the affairs of the province of Babylon to assist him. And even though Nebuchadnezzar had admitted, at least to Daniel, that Daniel’s God was a God of gods and Lord of kings, he did not turn from his pagan ways. He had made a golden image and commanded that all the princes, captains, judges, counsellors and rulers of all the provinces not only come to the dedication of his golden image but that they bow down and worship it or be thrown into a fiery furnace. True to his word, Nebuchadnezzar had these3 men cast into the furnace. Yet, not only did they not perish, Nebuchadnezzar saw 4 men walking in the midst of the fire and proclaimed that the fourth “is like the Son of God.” After calling the children from the furnace he blessed God who he proclaimed has “sent his angel…” to save them. The Bible does not specifically identify this 4th man. Was it an angel as Nebuchadnezzar assumed or was it Christ? Perhaps we can get a clue from the Hebrew word for furnace, Kuwr, which is spelled Kaf Vav Reysh. Kaf, a picture of the palm of the hand means to cover, to open, to allow or to atone. Vav, a picture of the wooden hook or the iron nail means to join or connect two things that are separated from one another. Reysh, a picture of the head means the master, the leader, or the prince. The Vav, as it is being used in the word Kuwr, connects the Kaf with the Reysh. As you might guess, these two letters form another Hebrew word, Kar, which is the word for Lamb. The Lamb is joined in the furnace! But who is this Lamb – the ancient Hebrew pictographs can help us there. The Kaf Reysh of the Lamb is the picture of the covering or the atonement of the Prince that will be necessary to deliver these three men from certain destruction. The two letters Kaf Reysh are also numbers. Together with the pictographs they complete the picture of this Lamb. Kaf, the number 20 stands for redemption. Reysh, the number 200 describes a tension between the insufficiency of man and the sufficiency of God. Jesus Christ, the Perfect Lamb of God, is the instrument of the Heavenly Father used for our rescue in the difficult circumstances of life, not just our rescue out of them. He is the one who will ultimately redeem us from sin as we are unable and insufficient to do that for ourselves. 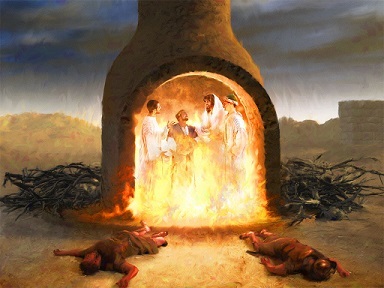 The Prophet Isaiah describes God’s purpose in these circumstances in Chapter 48:10: “ Behold, I have refined thee, but not with silver; I have chosen thee in the furnace of affliction.” It is in the fiery furnace of affliction, the Kuwr, that God reveals Himself to us and perfects us as we walk with Him. There is one final clue that the 4th man in the furnace is the Lord Jesus Christ. The Hebrew letter Dalet, the number 4,is a picture of the door, meaning an entrance or pathway to life. We now know that deliverance came from the Most High God who sent His son Jesus Christ who is the Perfect Lamb of God, the redeemer of His people, and the doorway to eternal life.